The Ad Council's campaign with adoption organization AdoptUSKids is evolving its idea that you don't have to be a perfect parent to adopt with a funny and touching campaign about adopting teenagers that's inspired by babycare guide "What to Expect When You're Expecting." Agency KBS collaborated with the authors and illustrator of "What to Expect When You're Expecting" on the campaign, which includes TV, out-of-home, print and digital. The idea of the TV spots and digital videos is to feature well-intentioned moms and dads attempting to give new parents of teens step-by-step parenting tutorials. 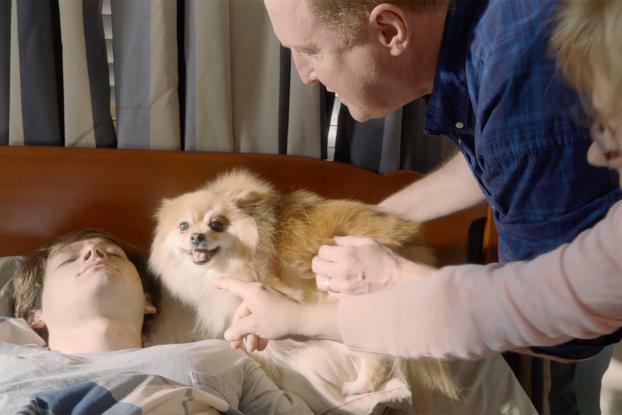 The first shows a couple trying in vain to demonstrate how to wake their adopted teenage son in the morning. Trumpet playing, loud vacuuming and getting the dog to lick him are all useless. It's only when they go downstairs to fry bacon that they unwittingly succeed--and are rewarded by a big hug. The spot was directed by Josh Soskin of Hey Baby Films. It will be followed by another spot that will demonstrate how to teen-proof your home.